Welcome to Old Brewery Antiques. 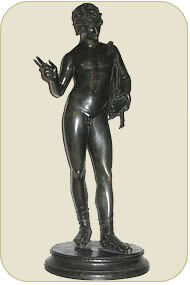 You are now under the antique figurines and statues page. Old Brewery Antiques offers you thousands of antique figurines and statues in this page. These great pieces of decorative arts had been existent as early as the pre-1800’s era up to the post – 1940’s. The antique figurines and antique statues offered here are made from the finest materials, which can be a solid or combinations of glass, ceramic, porcelain, bronze, cast iron, brass, pewter, and others. While most of them are originals, you can also see here both vintage and modern reproductions of these items. For the antique figurines, you can see here several images of the Virgin Mary, curved from wood, made from brass, as well as ceramic. You can also see here figurines of a dancing lady, may be a ballerina, made from bronze, silver, or a combination of the two. While for the antique statues, you can also see here several images of people, may be a mother, a lady, a dancer, or a baby, made from bronze, brass, porcelain, and other materials. All of the mentioned above are still of great shape and quality, and are made available in much reasonable prices compared to others. Old Brewery Antiques makes it easy for you as much as possible to gain only access to the most quality products that we have. Feel free to browse at the antique figurines and antique statues listed within this page. These antiques are surely a nice décor that will bring uniqueness and more beauty to your homes, so look and see if there’s anything that’s worth to be displayed on your household.